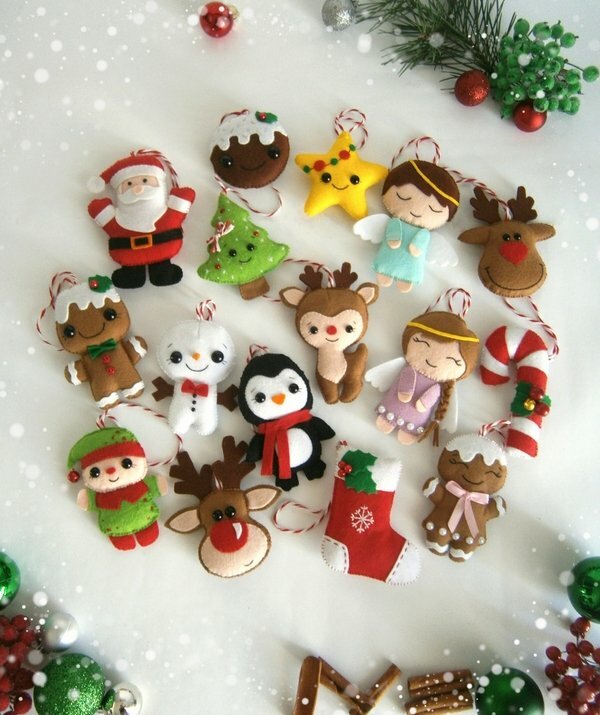 Felt Christmas ornaments are so adorable, charming and cute! 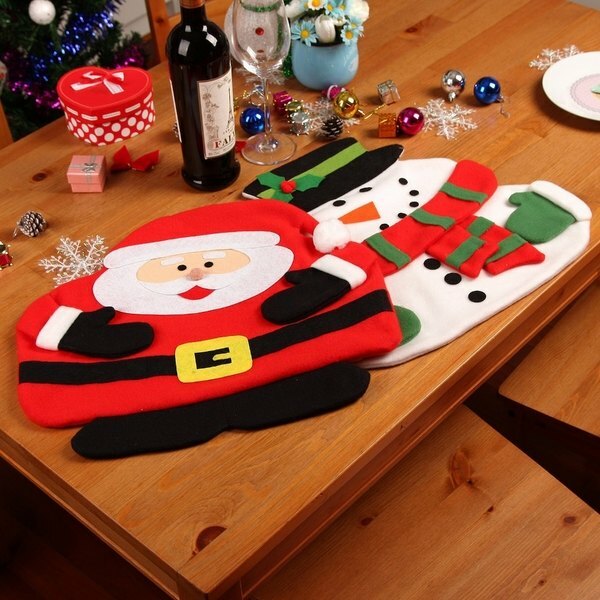 If you haven’t thought of this year’s Christmas decoration for your home, we selected some of the most colorful and joyful felt ornaments patterns. In this article you will find templates and patterns for various handmade Christmas tree decorations and a selection of photos which surely will inspire you for some Christmas crafting. 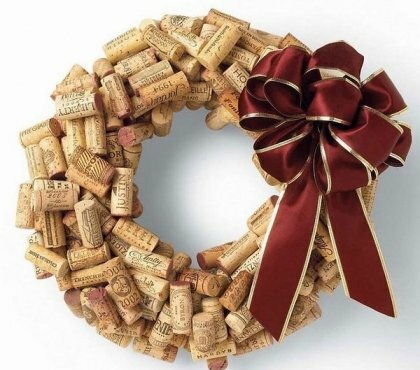 What is the most common Christmas decoration? Typically, those are glass ornaments, Christmas ornaments made of plastic or other materials. 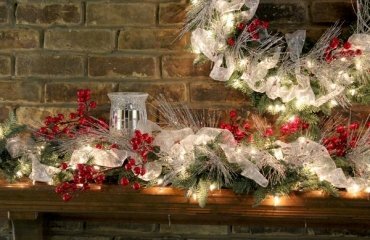 Such decorations can be found in almost every home, but we all agree that the monotony can be really boring and seeing one and the same Christmas decorations year after year makes a series of Christmases look too much alike. 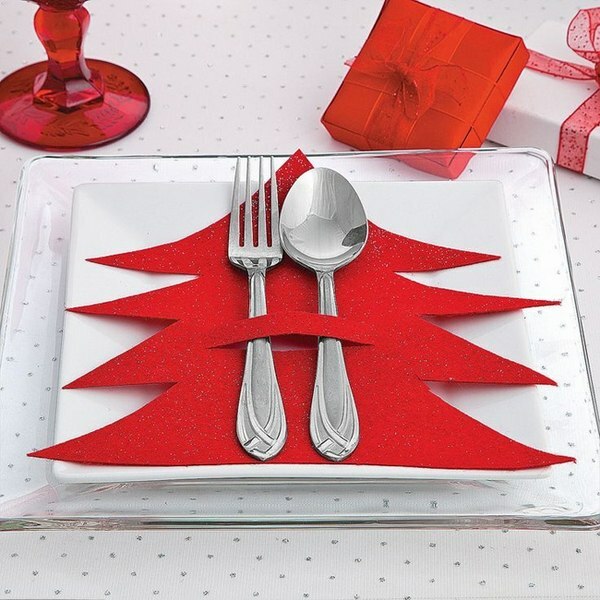 Decorations, as they do not have any practical application, are a pure expression of creativity. They have to be funny and add to the joyful mood. Felt Christmas ornaments will add to the holiday atmosphere in your home, they are perfectly safe for small children and you can use them in numerous ways – you can craft felt Christmas tree ornaments, felt Christmas wreaths, garlands, felt Christmas trees, table centerpieces and festive table decorations, you can make fantastic felt Christmas stockings, cute decorations for the mantelpiece, the dining chairs… the list can go on! 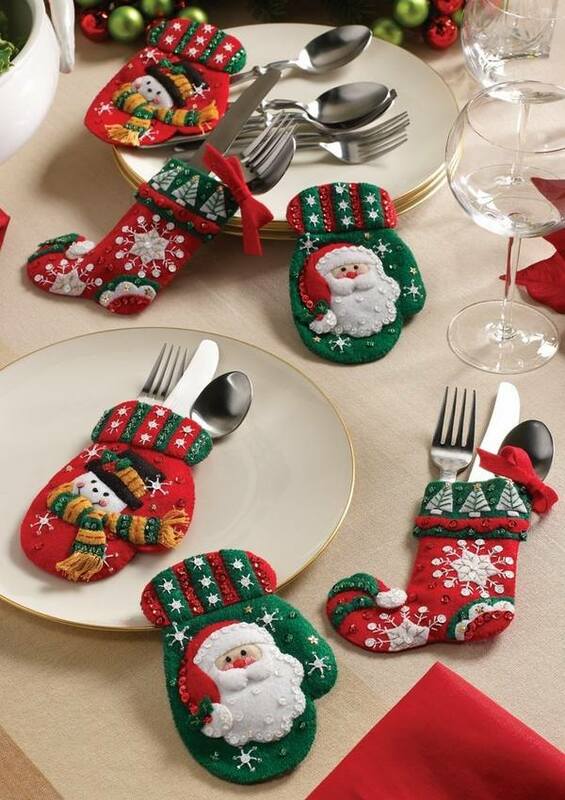 Small, original and fun, these ornaments will invite the Christmas atmosphere at your home. You can decorate the Christmas gifts for your friends and for your children and add felt ornaments as gift toppers or original handmade personalized gift tags. 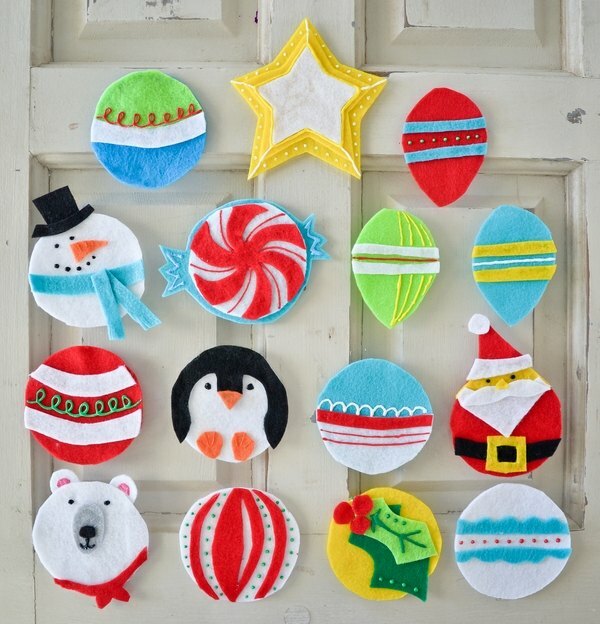 Felt Christmas ornaments – have a colorful and joyful Christmas! 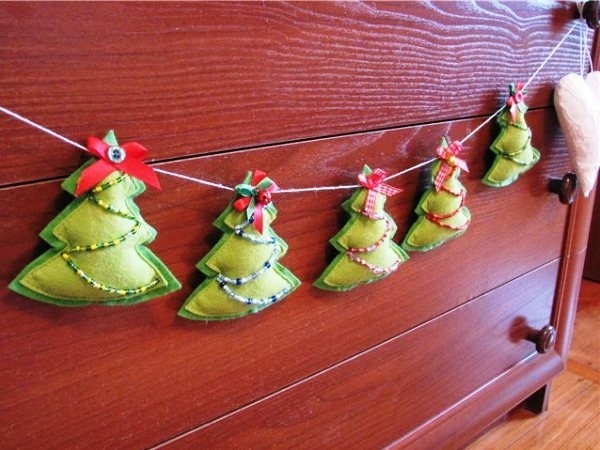 Felt Christmas ornaments can be a very nice surprise for your family and guests. 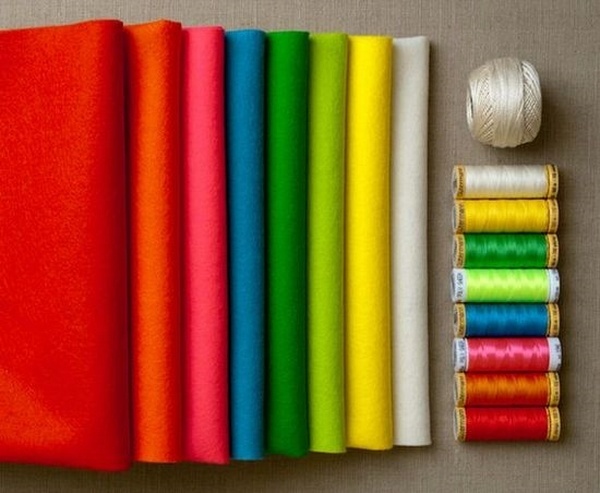 Felt is a fibrous material which strength and quality. There are different types of felt, and they differ in structure and width. 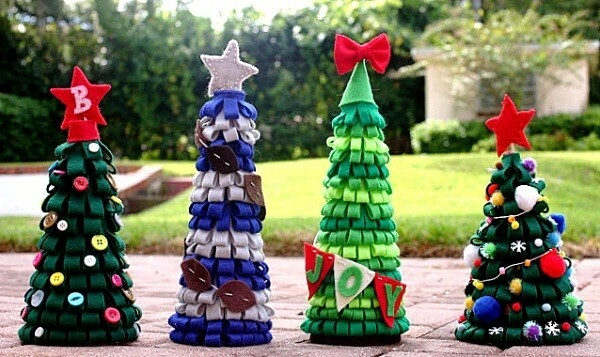 In addition, felt comes in such a wide varieties of color, that you can craft the most original and unique Christmas decorations. 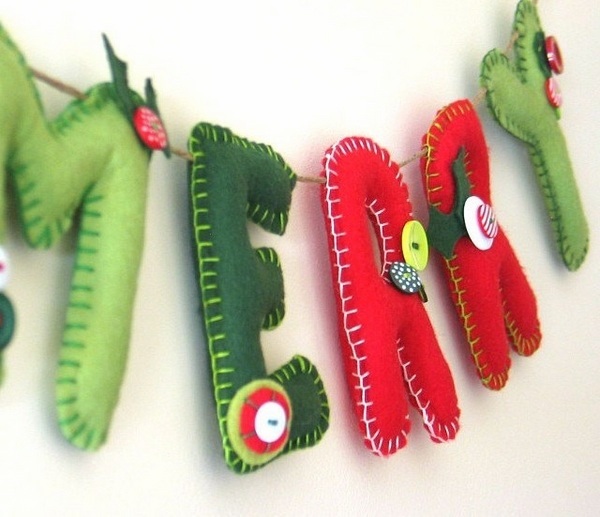 Felt is great to use for decorative purposes and is perfect as a basis for ornaments and other Christmas decorations. 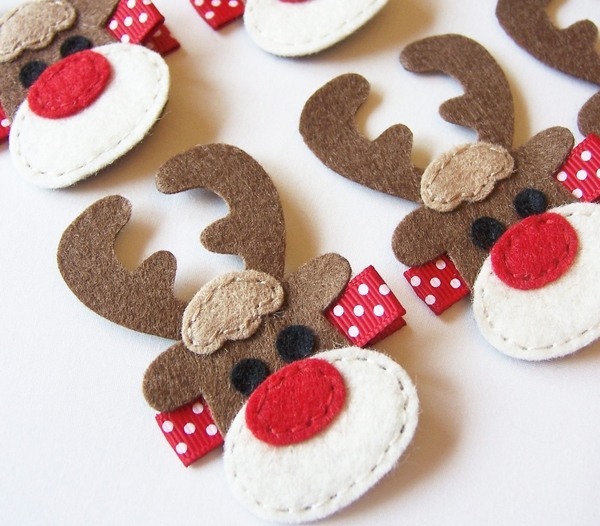 How to make felt Christmas ornaments? 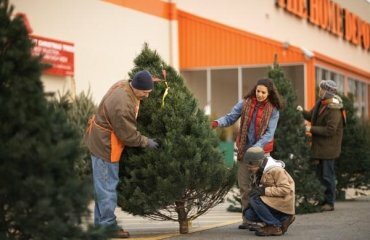 Those who are attracted to the idea of decorating their home with handmade Christmas decorations and Christmas craft projects will need some materials and some free time, and instead of spending a fortune on tree ornaments you can use a few weekend’s afternoons and enjoy yourself with some fun Christmas activities. 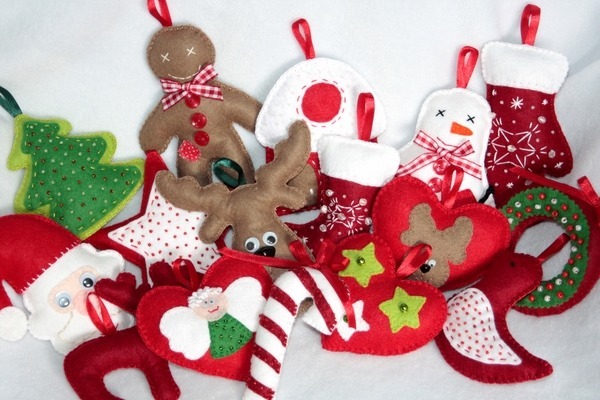 Saying that, keep in mind that making felt Christmas ornaments is a great fun activity for children of all ages – small children can use glue instead of needles, while elder kids can create their own patterns, even small gifts for their friends, teachers or grandparents. What do you need to make Christmas ornaments? 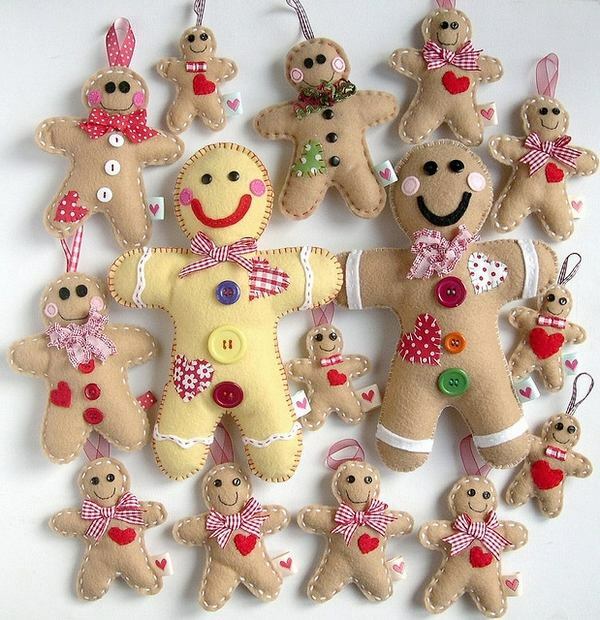 Beads, buttons, ribbons and other materials to decorate your felt ornaments. 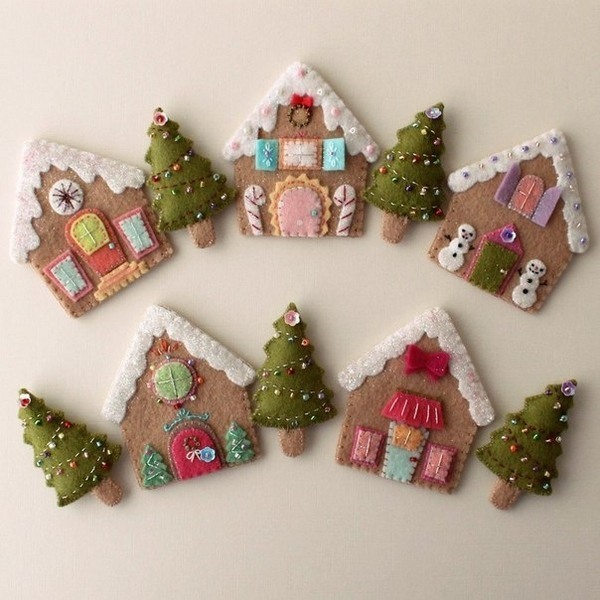 You can buy almost all the materials in craft sores and when you are ready with patterns, stencils, colorful felt and embellishments you can begin crafting your felt Christmas decorations. Generally, you must transfer the stencil on a piece of felt. It is very simple: the stencil is placed on top and you follow the contours. Then the ornaments are cut and sewn together. 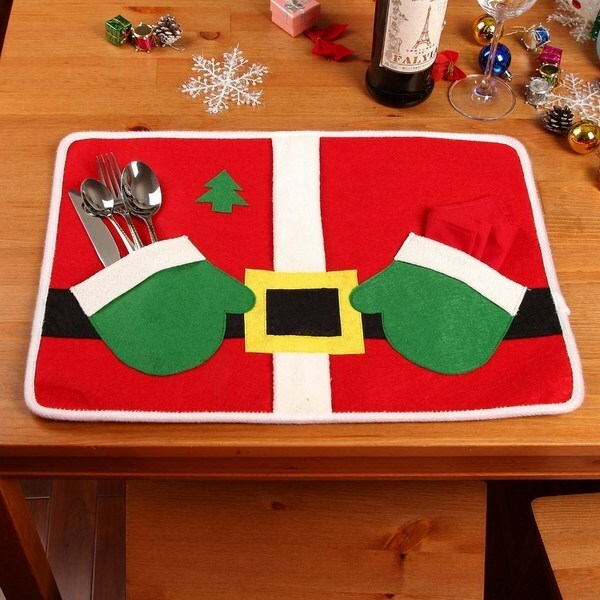 You can do this manually or by using a sewing machine. When joining the two parts of an ornament leave room to fill it with cotton wool or other suitable materials. Once your ornament is ready you can decorate it as per your taste and fantasy. 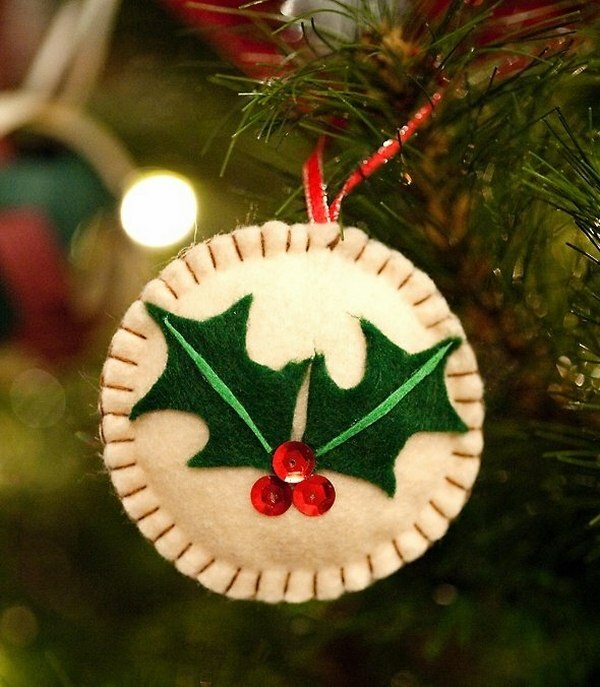 Take advantage of these fantastic felt Christmas ornaments ideas below and the easy instructions for making unique festive decorations. 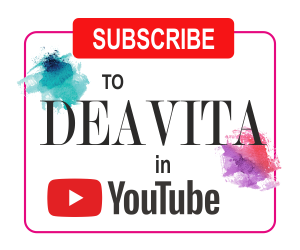 Christmas ornaments ideas – how to make felt garlands? 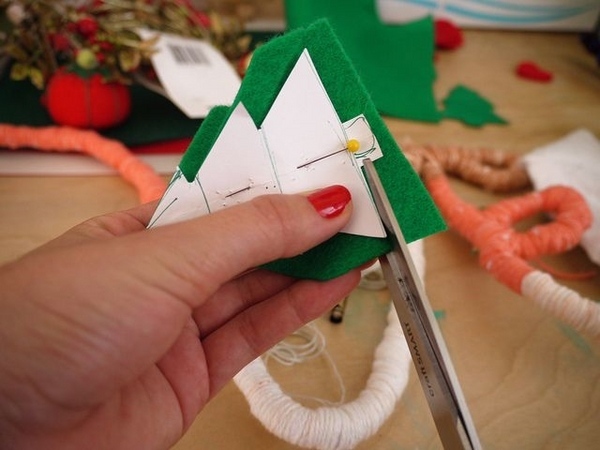 One of the easiest felt Christmas ornaments ideas is making a garland. First, it is relatively fast and an excellent idea for decorating the nursery room or kids bedrooms. 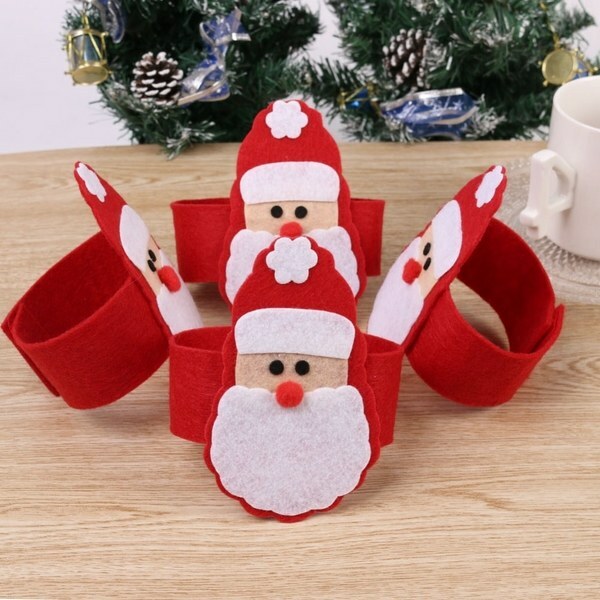 A felt garland will not lose its shape, it will not wrinkle or tear and you can use numerous motifs – from Christmas trees to balls, snowflakes, mittens, stockings, etc. 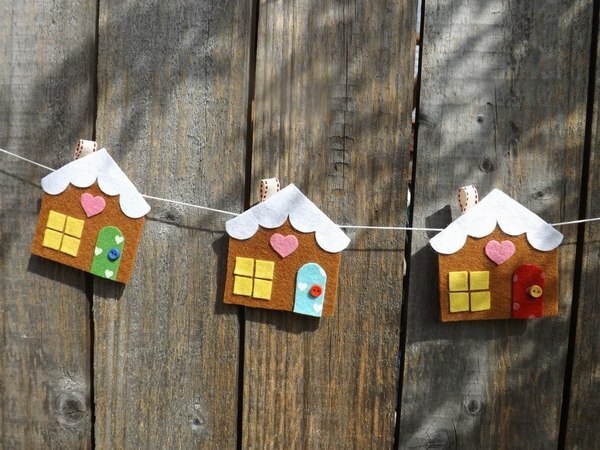 Making felt garlands is much easier than sewing toys: you just need to cut beautiful Christmas themed figures and attach them to a ribbon. 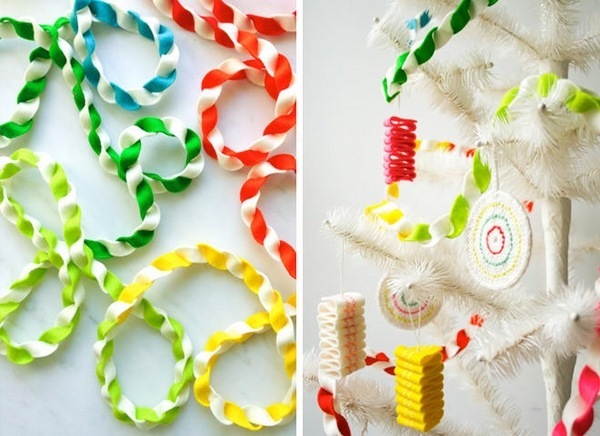 You can use just one color or make a felt garland from colorful elements. The easiest way to make a felt garland is to cut a large number of circles in bright colors and sew them with a strong thread. 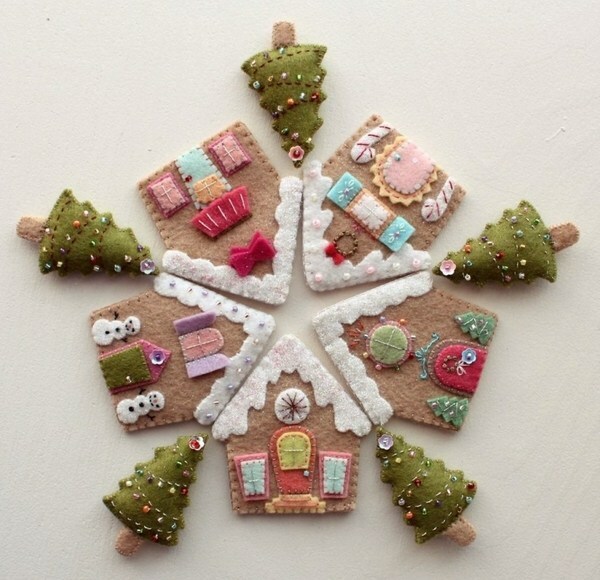 What shapes can you cut – hearts, snowflakes, stars, tiny socks – anything that you find easy. 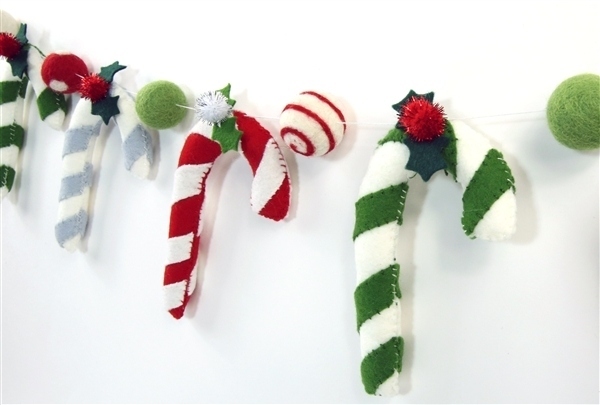 You can use your felt garland as a mantel decoration, wall decoration or arrange it on the Christmas tree. 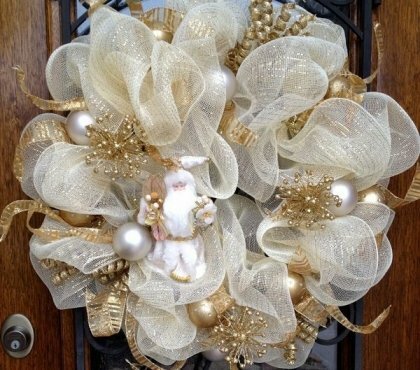 To make you garland more vivid you can combine felt ornaments with items from another material – large beads, bells or even glass ornaments, for example. You can cut out identical shapes or combine different ones. Id a garland of snowflakes seems too monotonous, combine them with silhouettes of Santa Claus, Christmas gifts, reindeer, stars and other elements. Such a composition would be a great Christmas wall decoration or Christmas window decoration. 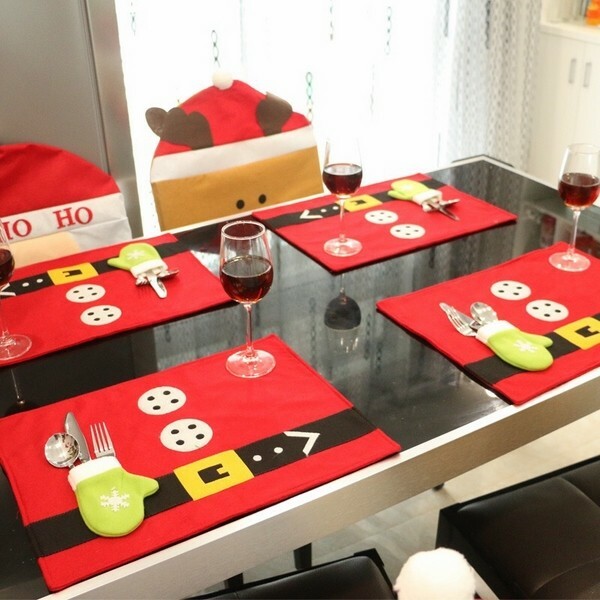 Decorating the table for the Christmas lunch adds to the festivity of the occasion. 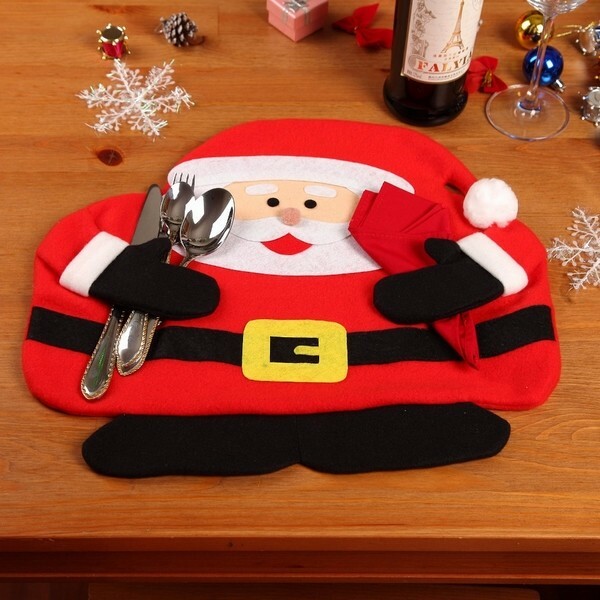 Due to the fact that felt is durable and stable you can craft a wide variety of ornaments and decorations – from small felt Christmas trees as a table centerpiece to napkin rings, place mats and cutlery holders. 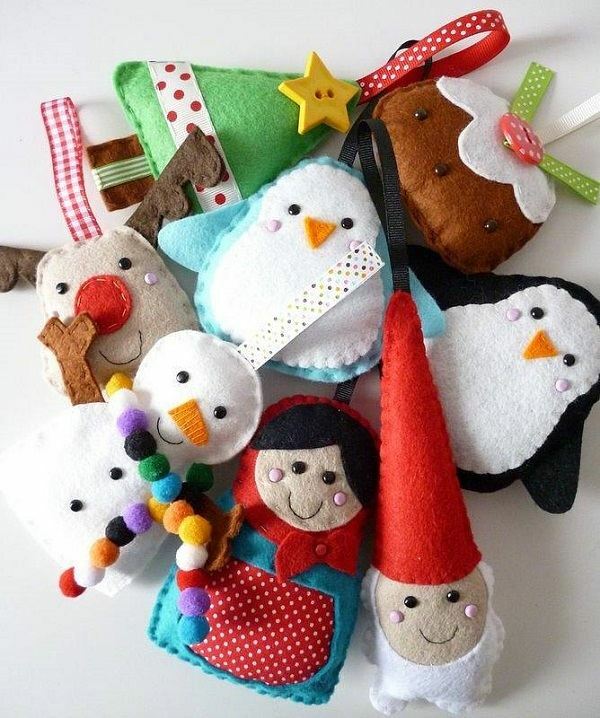 These gorgeous felt Christmas ornaments ideas can be an inspiration for cute Christmas present for your guests. 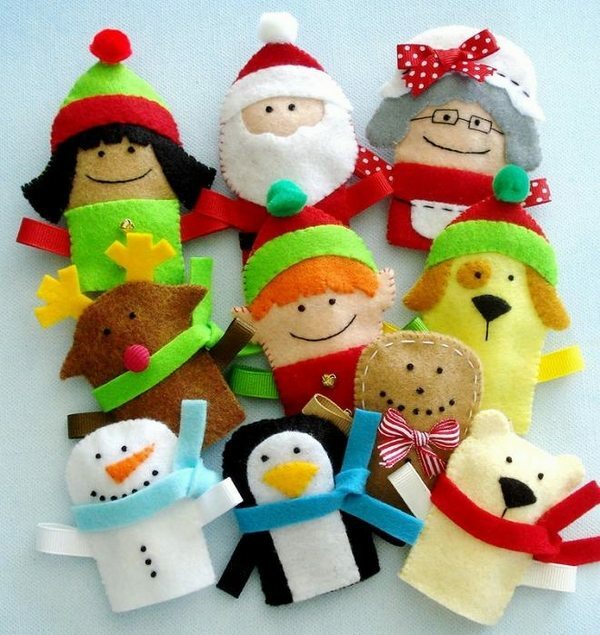 Last but not least we shall look at the plethora of felt ornaments ideas for decorating your Christmas tree. 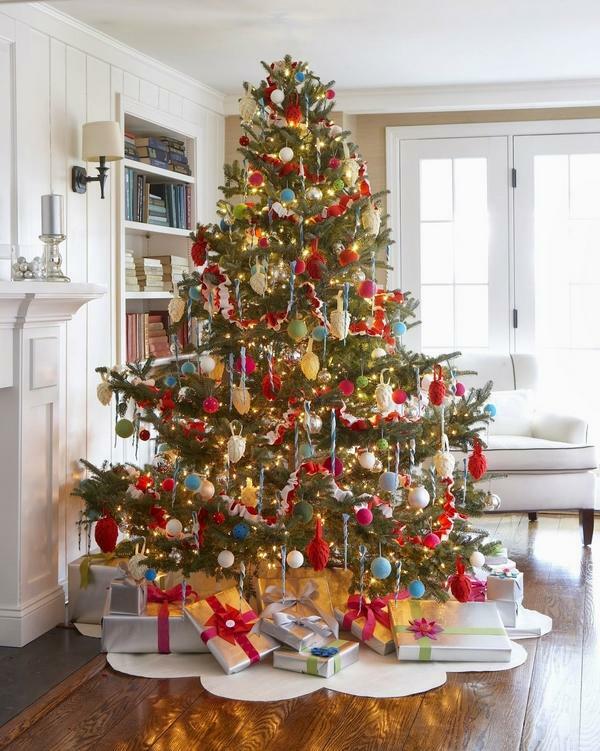 There are so many wonderful ideas how to decorate your tree in the most original way. 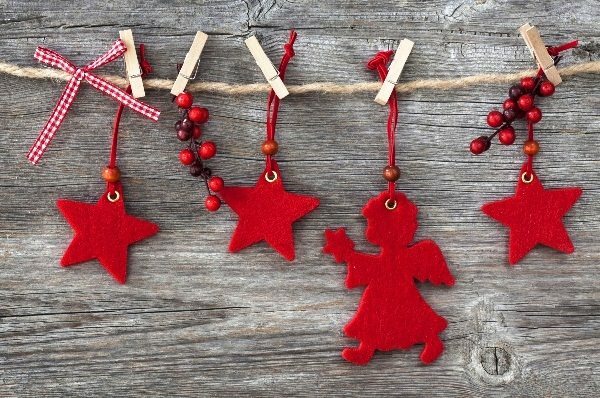 Remember that making cute ornaments is one of the fun Christmas crafts and activity ideas for kids. 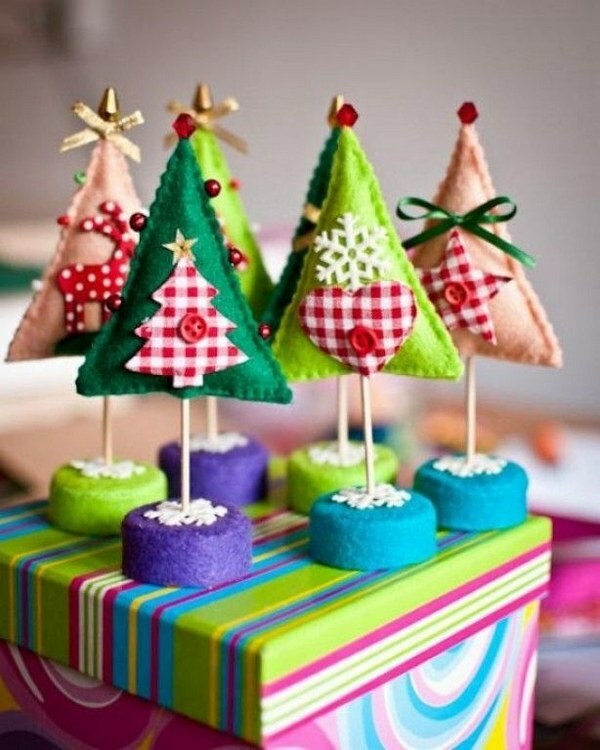 How to make a felt Christmas tree? Cut star-shaped pieces from green felt. Then stack them together and stick or sew. 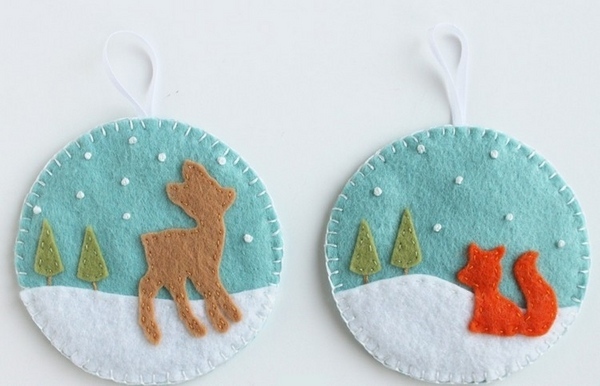 Add a star tree topper and your felt ornament is ready to be hung. Christmas tree ball made of felt look very original. Add glitter, beads, Christmas ribbons for more glamour. 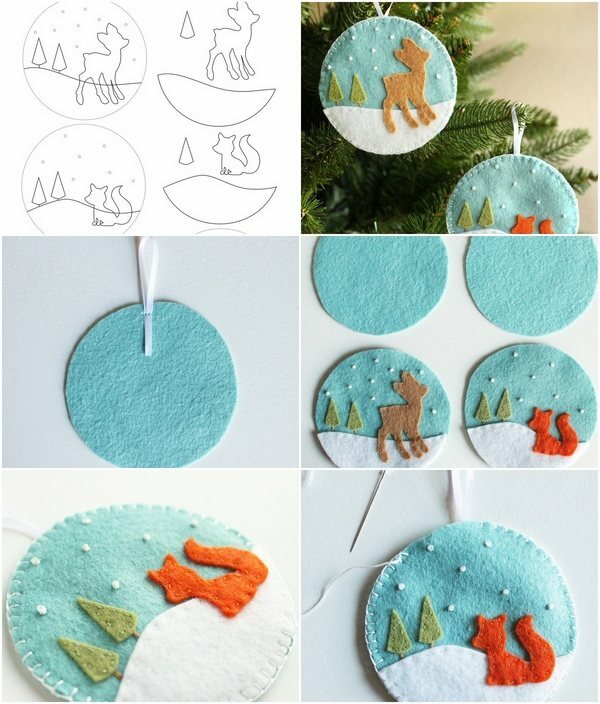 Here is an easy idea for felt tree ornaments. 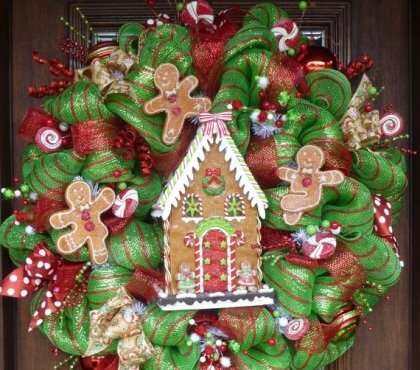 Cut out circles as a base and cut all the elements and pieces of the decoration. You can stitch or glue the elements on the base. 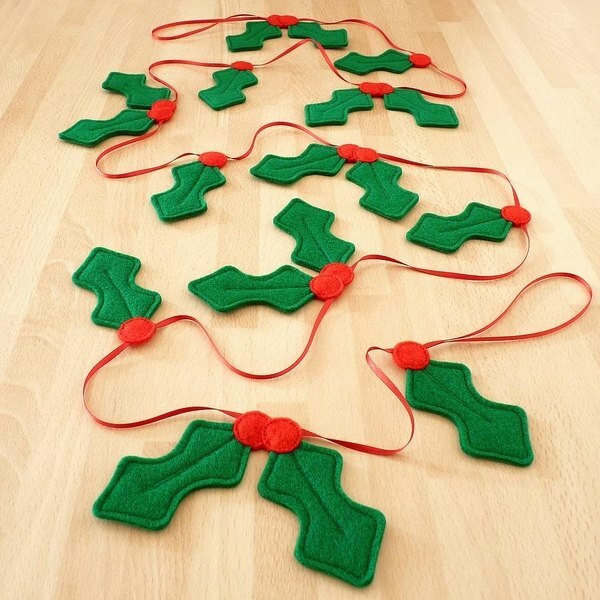 Fold a tiny ribbon in half to form a loop for hanging and sew it inside the second circle of each ornament. 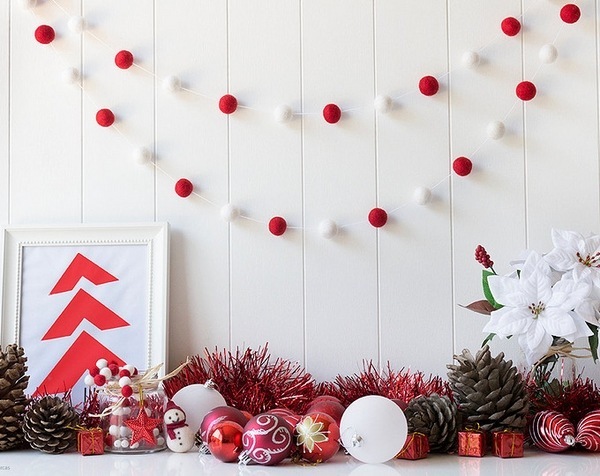 You could add a filling if you wish or leave your ornaments flat. 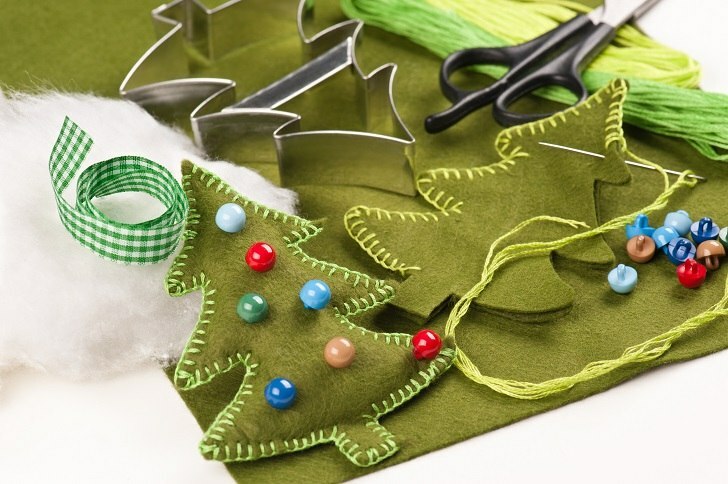 You can use a running stitch or a decorative a blanket stitch all the way around, optionally hot glue, to assemble the ornament. 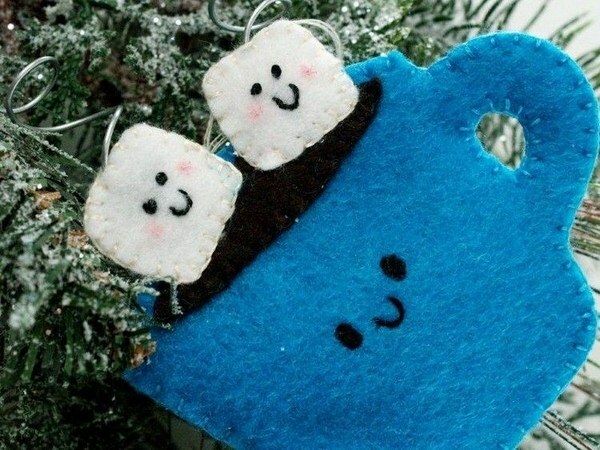 Another cute felt ornament idea is the hot cocoa ornament. Start by cutting out all your pieces out of felt. Use the pattern and trace the contours on the felt. 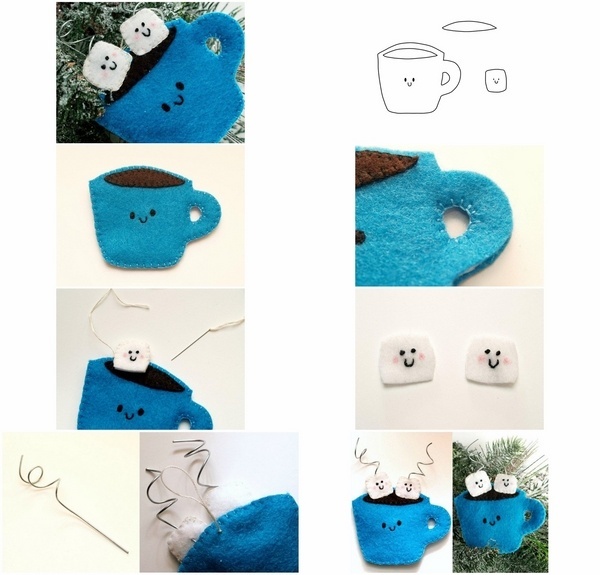 Using blanket stitch, sew the cocoa to the mug. Decorate the marshmallows – sew eyes and mouth (optionally use hot glue and cut the mouth and eyes from felt) and sew them to the mug. You can cut a layer of filling and add a layer between the front and the back of the mug or leave it flat. 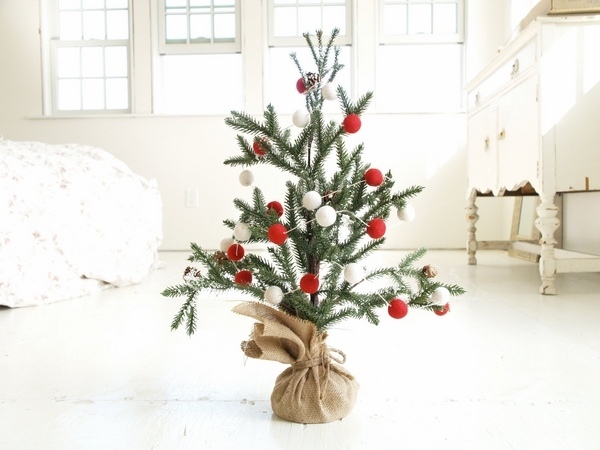 Making a Christmas tree as an ornament for the real tree is pretty easy. 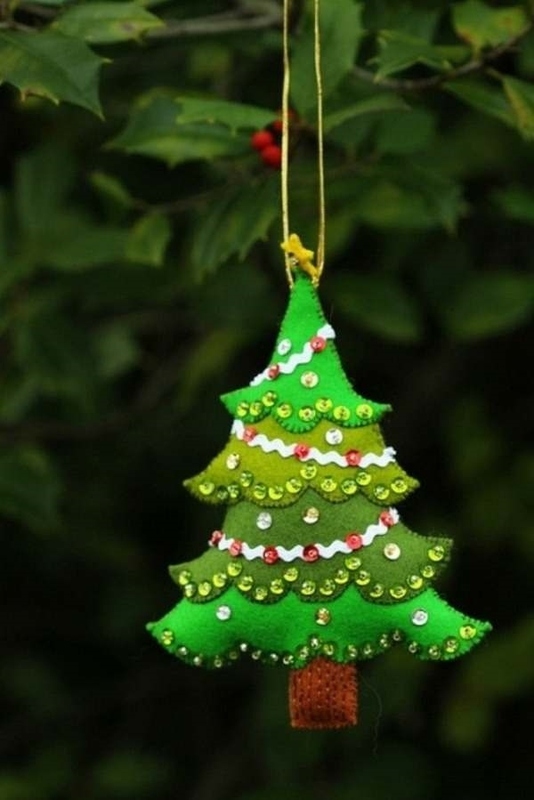 You will need green felt, scissors, paper, pencil, thread and needle, some beads, filler (optional). Draw a silhouette of a Christmas tree on paper and cut it out. Pin it on the piece of felt, trace it with a pencil or chalk and cut it out. Sew or glue beads on the ornament. 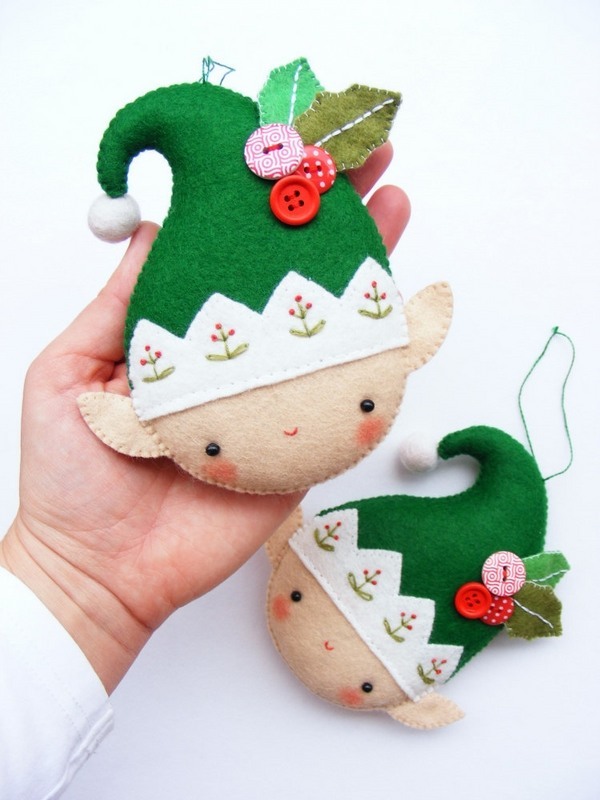 Finally, add a filling and sew together the two parts of the ornament with blanket stitch. 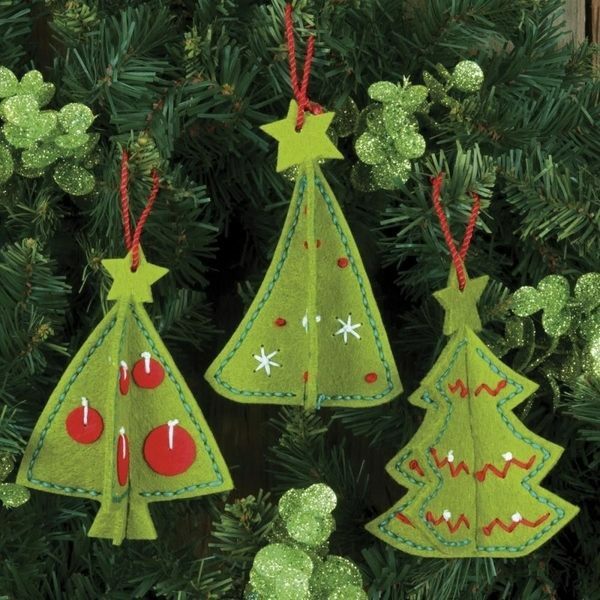 Using the same technique you can make felt tree ornament in different colors and shapes. If you are not skilled at sewing, you can use glue. 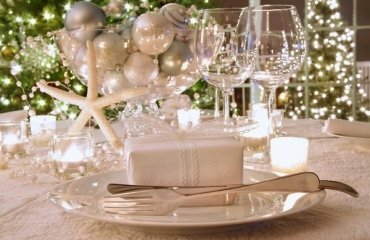 You can add a modern touch by choosing trendy colors instead of traditional red, green and white, geometrical or any unusual shapes, instead of Christmas symbols. 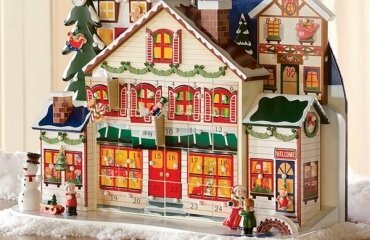 However, keep in mind that children will find it hard to understand contemporary, unusual or futuristic decorations, so it is advisable to keep to penguins, snowmen, reindeer, Christmas trees, balls, lights, bells, owls, gifts, houses, gingerbread man, Santa Claus, etc. 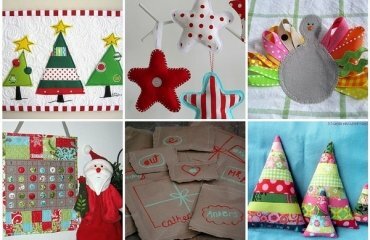 Enjoy the gallery below and you will definitely find a lot of inspiration for your felt Christmas ornaments!